Out since Week 9, Cobb has been limited to just five games this year because of the lingering hamstring injury. His history with quarterback Aaron Rodgers and ability to get open in traffic could help especially in giving the Packers (4-6-1) another target on third down. Green Bay is just 24th in the league on third down conversions (37 percent). 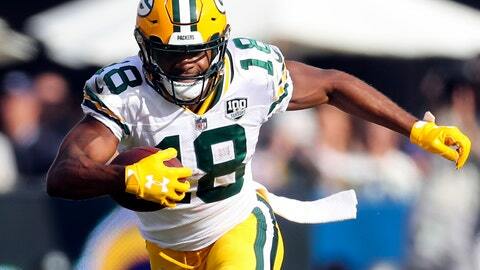 “You go down on a Wednesday of practice, you’re in a unit drill, and you’re kind of at whatever speed you’re going, and he’s out there doing all the little things exactly right,” said McCarthy, who singled out Cobb as a mentor for young receivers. “Well it would be great to get Randall back. I think today will give us some information,” McCarthy said. Looking good as of Thursday, when Cobb was limited for a second straight day. The versatile Cobb has caught seven of 11 targets on third down this year, averaging 17.9 yards a catch. In his career, Cobb has 125 receptions on 188 targets on third down, averaging 14.2 yards and converting 92 first downs. He worked out before the loss at Minnesota before being held out. Cobb was just a spectator when the Packers converted just 2 of 10 on third down. Besides Cobb, the Packers also don’t have Geronimo Allison because of a season-ending groin injury. Tight end Jimmy Graham is trying to play through a thumb injury. That has meant more attention to No. 1 wideout Davante Adams , who is still good enough to have already reached career highs of 1,022 yards on 77 catches. Rookies Marquez Valdes-Scantling and Equanimeous St. Brown have had to take more snaps, with mixed results. Rodgers spoke this week about taking some “calculated risks”. Lately, that has meant moving Adams around to different spots; getting running back Aaron Jones the ball in space; and working in Graham. “If that means breaking a tackle, making a guy miss or hitting the open man or whatever that is, we’ve got to find a way just to make sure we’re taking care of our jobs,” he said. NOTES: Left tackle David Bakhtiari (knee) returned to practice as a limited participant, an encouraging sign after McCarthy said he thought Rodgers’ blind-side protector might focus on rehab on Thursday. It’s important with the Packers getting ready to face Cardinals pass-rusher Chandler Jones (11 sacks). Starting left guard Lane Taylor (quad) was also limited. … Bashaud Breeland (groin) returned to practice, while fellow CB Kevin King (hamstring) was limited for a second straight day. … Graham was limited.